Receive Email Promotions and/or Catalogs from us. Sign Up Here! Item #SC-TPGD-01: 13x10.5mm 14Kt. Yellow Gold tie tack for engraving. 3.36 grams TW. Item #SS-1459: Sterling Silver Money Clip with 2001 Kentucky State Quarter. Item #OC-CF-372-1: 14Kt. Yellow Gold Cuff Links with two bezel set 5x7mm oval Australian Opals of .85 cts. TW. Item #SC-TPOP-01: 14Kt. Yellow Gold Tie Tack with one bezel set approximately 9mm freeform Australian Opal Doublet. Item #OC-TP-187-5: 14Kt. Yellow Gold Tie Tack with one bezel set 6x8mm oval Australian Opal of .67 cts. Item #OC-TP-193-3: 14Kt. Yellow Gold Tie Tack with one bezel set 5x7mm oval Australian Opal of .39 cts. Item #SC-CLBP-0467: Man's 14Kt. Yellow Gold Ladybug Cuff Links with four 6x12mm Black Onyx Cabs with inlaid Mother of Pearl Spots, six round Diamonds of .04 cts. TW pavé set in White Gold and two bezel set round Ruby Eyes of .04 cts. TW. Item #CLBO-0169: Man's 14Kt. Yellow Gold Cuff Links with 1/2"x1/2" octagon Black Onyx and twenty-four round Diamonds of .13 cts. TW pavé set in White Gold. Item #SC-BKBP-10-X1: 2"x1.5" tall Sterling Silver Belt Buckle of 47.78 grams with checkerboard inlaid Black Onyx and Mother of Pearl. Item #SC-TPBP-82: 14Kt. Yellow Gold Tie Tack with 8x12mm oval flat top Black Onyx & Mother of Pearl. Item #SC-CLBP-438: Man's 14Kt. Yellow Gold Ladybug Cuff Links with four 5x12mm Black Onyx Cabs with inlaid Mother of Pearl spots and four round Diamonds of .02 cts. TW pavé set in White Gold. Item #SC-CLBO-458-XL: 14Kt. Yellow Gold Cuff Links with two 6x29mm Black Onyx Cylinders. Item #SC-CLBO-151: 14Kt. Yellow Gold Cuff Links with 6x20mm Twisted Black Onyx. Item #SC-CLBO-0187: 14Kt. Yellow Gold Cuff Links with two 7mm square cut Black Onyx Cabs. Item #PE-0U-S001: Man's 14Kt. Matte Yellow Gold Horse Head Cuff Links with Black Onyx; 19.65 grams TW. Item #SC-TSBO-458-X1: Set of four Man's 14Kt. Yellow Gold Shirt Studs with Filigree Rope Decoration and four 5x12mm Black Onyx Cylinders; 10.07 grams TW. Item #RCK-ER0655: 14Kt. Yellow Gold Lapel Pin with one prong set 10x14mm oval Black Onyx Cab, four round bezel set Rubies of .20 cts. TW & .23 cts. TW round Diamonds pavé set in White Gold. Item #SC-TPBP-467: Man's 14Kt. Yellow Gold Ladybug Black Onyx Tie Pin with inlaid Mother of Pearl Spots, two bezel set round Ruby Eyes of .02 cts. TW and three round Diamonds of .02 cts. TW pavé set in White Gold. Item #SC-TPSA-31-X1: 14Kt. Yellow Gold Tie Pin with six 1.8mm square Blue Sapphires of .34 cts. TW and four 1.8mm princess cut Diamonds of .14 cts. TW. Item #11843: 18Kt. Yellow Gold Man's Ring with oval Blue Sapphire of 1.80 cts. and four baguette Diamonds of .73 cts. TW; Size 10 1/4. Item #CSJ-1503: 14Kt. Yellow Gold Tie Tack with one 9.4x12.5mm oval Blue Sapphire Cab of 7.76 Cts. Item #HOO-SC-132: 14Kt. Yellow Gold Tie Tack with one bezel set 11x14mm rectangle Italian Carved Warrior Mother Of Pearl Shell Cameo. Item #HOO-SC-136-A: 14Kt. Yellow Gold Tie Tack with one bezel set 10x14mm Rectangle Italian Carved Warrior Abalone Shell Cameo. Item #HOO-SC-136: 14Kt. Yellow Gold Tie Tack with one bezel set 9x12mm Rectangle Italian Carved Warrior Abalone Shell Cameo. Item #GSJ-2296: 14Kt. Yellow Gold tie tack with shield cut Colorless Danburite of .97 Cts. Item #KK-BG-321: 1 7/16" x 1/2" 14Kt. Yellow Gold Golf Clubs with Bag Brooch with four bezel set Round Diamonds of .12 cts. TW; 5.85 grams TW. Item #SC-TPEM-31-X1: 14Kt. Yellow Gold "X" Tie Tack with six 1.8mm square Emeralds of .22 cts. TW and four 1.8mm princess cut Diamonds of .14 cts. TW. Item #SC-TSEM-07: Set of four 14Kt. Yellow Gold Shirt Studs with four bezel set 3mm round Emerald Cabs of .52 cts. T.W. and forty-eight round Diamonds of .20 cts. T.W. paved in White Gold. 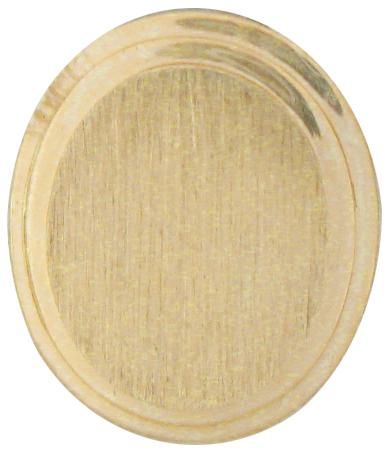 Item #SC-TPGD-1: 11.5mm round 14Kt. Yellow Gold tie tack for engraving. 3.12 grams TW. Item #KK-TG-365: 7mm round 14Kt. Yellow Gold golf ball tie tack. .72 grams TW. Item #SC-CLHM-561: Man's 14Kt. Yellow Gold Cuff Links with two Bezel set 12x12mm octagon Flat Top Hematite Cabs and two round Diamonds of .08 cts. TW bezel set in White Gold. Item #CSJ-4574: 14Kt. 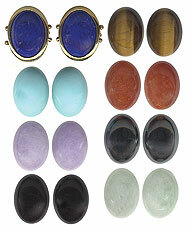 Yellow Gold Interchangeable Cuff Links with one pair each 12.5x17mm oval Lapis Lazuli, Golden Tiger’s Eye, Persian Turquoise, Burmese Red Jadeite, Burmese Lavender Jadeite, Hematite, Black Onyx and Burmese Green Jadeite Cabs. Item #CSJ-4398: 14Kt. Yellow Gold Tie Tack with one prong set 5.8x8.1mm pear shape Iolite of .88 cts. ; Clutch back. Item #DR-34349: 14Kt. Yellow Gold flag tie clip with twelve square & triangle Iolites of 1.28 Cts. TW, sixteen square Pink Tourmalines of 2.39 Cts. TW and twelve square Aquamarines of .82 Cts. TW. Item #SC-TPLP-26: Man's 14Kt. Yellow Gold Tie Pin with one 5x12mm Lapis Lazuli Faceted Cylinder and ten bead set round Diamonds of .07 cts. TW.